You are here: Home > Community > Blog > How Do Subliminal Messages Work? And do subliminals work in hypnosis? Teenagers can be annoying. Okay, for the sake of balance, some teenagers can also be wonderfully creative, energetic, funny, clever, and kind too, of course. But some teenagers, some of the time, can be annoying. That's more reasonable, isn't it? Now just imagine you're, say, a theatre manager, having to make your expensive rent pay for itself and make you a profit. Now imagine the square in front of your theatre is besieged by threatening and loutish young folk. Their presence is putting off customers. Business is dying. What would you do? You've tried asking them politely to move on, but this has had all the effect of a paper windshield in a hurricane. In 2006, a sonic device known as 'The Mosquito' was installed by The Wyvern Theatre in Swindon in the UK (1). And...it cleared the troublesome teenagers quicker than water off the back of a supersonic duck travelling through a heated wind tunnel. How did this magic work? It seems that The Mosquito (so named because its sound resembles the buzzing of the fiendish insect) emits a harmless ultrasonic tone that can only be heard by people under the age of 25. The longer someone of that age is exposed to the sound, the more annoying it becomes. Wow! Cheri Wright, an 'anti-social behaviour co-ordinator' (put that on your CV! ), reported that after three weeks of use, criminal damage and problems caused to shop owners had reduced dramatically. What a neat solution. Although, I guess not great if you're a law-abiding young person! So how do I connect this interesting snippet to subliminal messages and hypnosis? The point here is that in order to be affected by this noise, you had to be able to actually hear it. The Mosquito isn't subliminal, because those affected by it (young people under 25) consciously recognize the sound and know just what is annoying them so. I mention this here to illustrate the point that to be affected by something, we need to actually pick it up with our senses. If we are affected by it but we weren't conscious of having processed the information, then it has worked on us subliminally. But if you don't pick it up through your senses, it will not affect you. The adults who could not hear the sound were not affected by it, simple. How many people have been sold the idea that some subliminal sound they cannot hear is having some kind of effect on them? If someone tells you that suggestions 'below the level of conscious hearing' are working 'subliminally', remember how the adults over 25 years old in Swindon didn't respond to what they couldn't consciously hear and were able to attend the theatre. Of course, there might be a placebo benefit to believing you are benefitting from 'suggestions you can't hear', but that's another story. So how do real subliminal messages work? Subliminal influence is correlated to what we don't notice consciously, but our senses still pick up. For example, people are affected by the presence of a briefcase in a room to behave more competitively or by the faint smell of cleaning fluid to behave more hygienically, even without consciously noticing these environmental 'suggestions' (2). But their eyes and noses in both cases would have had to have detected either the briefcase or the cleaning fluid smell. If your eyes or nose don't detect it, then it will not influence you other than through the placebo response. When we respond to an environmental trigger without having consciously registered that trigger, it will be because that trigger - whether it's the faint smell of cleaning fluid or particular types of words presented to you in a 'hidden pattern' - will affect you through a kind of 'metaphorical influence' so that your mind concludes a pattern from this trigger. What do I mean? Well, the whiff of cleaning agents barely registered consciously, if at all, may present the pattern to your mind of cleanliness as a general trait and influence you by getting you to 'spontaneously' be tidier or cleaner in your behaviour. The undoubted powers of visual, olfactory, and auditory subconscious influence are huge; and words and other sounds can certainly (sometimes especially) influence when we're not paying conscious attention. BUT you need to be able to hear them. The idea that they are working 'below the level of normal hearing' is bogus. So how does all this relate to hypnotic communication? People often worry that therapeutic or performance-enhancing hypnosis will not work for them if their mind wanders and they stop consciously listening to suggestions and ideas presented to them whilst they're relaxing. If you focus directly on the hypnotic suggestions - because your unconscious mind will also be listening. Even sometimes when your conscious mind rejects a suggestion as 'impossible'. AND when your conscious mind is distracted. 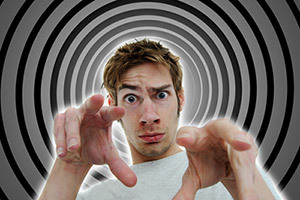 In other words, hypnotic suggestions can still have an effect if you're not consciously paying attention to them. But your senses still need to be picking them up. In fact, many hypnotherapists positively encourage the conscious mind to focus elsewhere so that it can 'get out of the way'. Hypnotic communication needs to be targeted toward the unconscious mind. It is, after all, this part of the mind that maintains the problem. People don't consciously decide to blush or stutter or have a panic attack. We want changes to take place below consciousness. Likewise, people don't know consciously how to cure themselves of warts or make other psycho-physical changes, so conscious interference when making these kinds of suggestion can sometimes slow down the effect. Once there was a young boy who dissected a fly because he wanted to discover how it worked. After dissection, he found he was left with legs, a body, and wings, but now he wondered where the fly had gone. In our culture, we are all encouraged to analyze and use logic, a wonderful legacy from ancient Greece. But logic has its limits and if you overanalyze some aspects of life, you lose the 'juice' from the idea or situation. For example, some things strike you as funny and you don't know why. As soon as you start to analyze, to 'pick apart' the humor, it disappears. Just as the essence of the fly disappeared for the little boy. Metaphor appeals to the part of the mind that is beyond conscious awareness. Of course, you know that 'metaphor' is not a 'world', but I'm guessing you didn't unpick the 'The wonderful world of metaphor' metaphor above. Metaphors are used all the time and because we don't tend to unpick them consciously, they can (if used well) appeal and communicate directly to the subconscious mind. A metaphor is a pattern that, whilst perhaps seeming different or even irrelevant, corresponds to another pattern. For example, the pattern of a faulty car alarm could correspond as a metaphorical pattern for panic attacks: the body's emergency system, which might keep 'going off' when it doesn't need to. This is quite an obvious pattern match, but if we consider the briefcase for a moment as a metaphor for competitiveness, then we see how metaphor is much more intrinsic to human experience than we might have thought and also how it can work subliminally. What's more, people in deep hypnotic trance can be listening whilst not listening. I mean, the conscious mind may have drifted off and be 'asleep' or deeply absorbed in some other way, whilst the unconscious (also known as the subconscious) mind can still be listening and actively absorbing and responding to suggestions. In this way, people can be surprised later when they respond to a suggestion they didn't know they were given, such as to resist unhealthy food or feel calm with a person who before would have intimidated them. This is how we use subliminal influence in hypnosis; not by communicating or trying to communicate below sensory awareness, but by direct communication to the part of a person's mind that is beyond or 'below' (to use another metaphor) a person's conscious mind. If you'd like to learn how to do self hypnosis, give our free online course a try. As reported by BBC Wiltshire. See for instance: Bargh, J. A. (2006). What have we been priming all these years? On the development, mechanisms, and ecology of non-conscious social behavior. European Journal of Social Psychology. Volume 36, Issue 2, pgs 147–168.